Boston USA Globe Best Readaloud Picture Book 2011. SCATTERED AUTHORS. RIF. TESOL cert. School powerpoint presentation on writing: inspiration; the process involved in book publishing; followed by up to 4 workshops for all year groups. Published ages range - nursery/picture books up to YA fiction and include education fiction and trade fiction across all primary year groups. Events have been held in China, Prague, Denmark across the UK and in other territories. Events for all ages and abilities on a broad range of books. Cathedra 900, sponsored by Literature West. 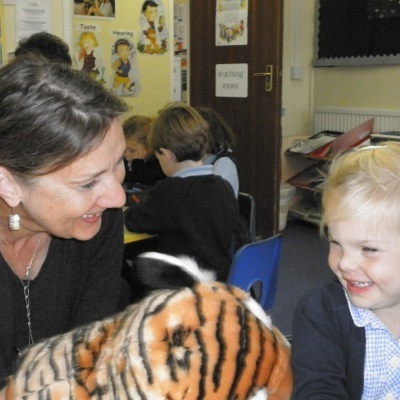 Consultant for nursery educators/professionals on engaging early year groups through the imaginative use of picture books. Texts for struggling readers- BEAST HUNTER. Older events include, The Egyptian Experience, masks and disguises and Ghost stories. Best-selling picture book Here Comes The Crocodile/ nominated for the Sheffield & Nottingham childrens' book awards. Supported by the Arts Council South West. Events held at Bath, Cheltenham, Birmingham, Salisbury, Sheffield and Lowdham and the Edinburgh International Festival. Regular visitor to schools throughout the UK and Europe. Sponsored by the Arts Council for work in HMP on creative writing . Fee: £350 per day - plus travel. A beautifully illustrated book about a family of badgers. Pop A shiny brown nut bursts up from the ground. A funny magical picture book. An beautifully illustrated and exiting book about Ruby & her friend Mai dealing with pirates, dragons and giants on camp. THE GIFT - RECOMMENDED FOR YEARS 5 & 6 PRIMARY. Igloo books - part of the Three Together Mystery Series. A beautifully illustrated tale about not wanting to leave your friends. Highly Readable, exciting tale in the Wired Up series. Sniff, sniff, scuttle, scurry, it's time for tea! Mouse was on a cheese hunt. Where could it be? Discover some of the messy, funny, noisy ways your favourite animals play in this enchanting book with gentle rhymes and soft illustrations. Rigby Navigator Max. 3 short stories for guided reading. Red Level. Rites of passage. Stories from other cultures contain The Hunt. KS2 Literacy World. Quenna embarks on a dark adventure and wonders if she'll ever see home again. A bedtime book exploring the amazing and funny ways animals sleep - from an upside-down bat to a baby kangaroo. An exciting tale about the Arctic and its impact on the life of a two small boys. Exciting Science fiction for ages 7 - 11.